Talkzone on your court with loaded service. TalkZone tariff gives you the golden opportunity to get advantage of massive off-peak discounts. And this very dynamic discount offer, makes it possible for you to enjoy low charge rate when making call. As this depend on the side of which you are making the call from. Read on to see some of its full details and features. 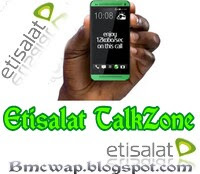 √ READ ALSO: Updated: Features Of Etisalat EasyCliq Tariff Plan. Now, to check the exact place or location on the tariff in which you are calling from, just dial this code *551#. always express your experience on any of the tarrif plans above. You can use the comment box for that.